All parts of this plant are poisonous, including the rhizome. Red fruits are produced which are juicy and sweet smelling, but contain a highly toxic alkaloid. Yellow-green flowers are also produced, which are fragrant with a pervasive rose-like scent. 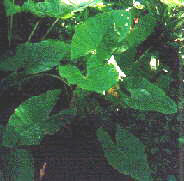 Has large spade shaped leaves which are soft green in colour and form a clump one to one and a half metres in height. This plant grows in wet or poorly drained areas in rainforests and adjacent areas. Is found in Australia and throughout South East Asia.